We have transferred all of our files to our new, faster server.� If you have any problems accessing pages in our website, please let me know. 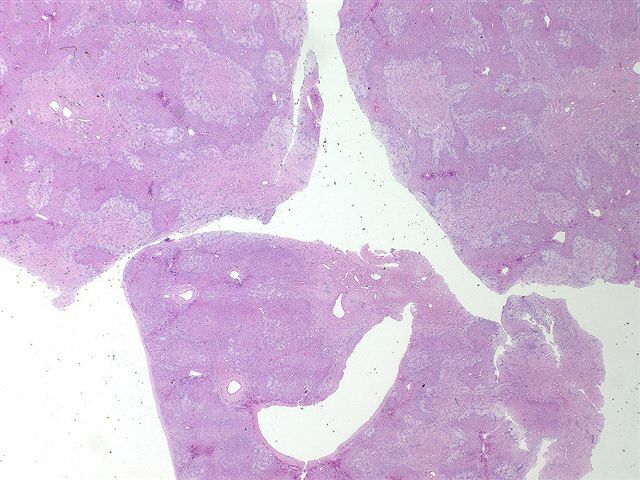 How can you find detailed pathology information in 15 seconds or less?� Use our free online textbook.� From the Home page at www.PathologyOutlines.com, click on the appropriate chapter, then on the topic in the Table of Contents, and you will be directed to clinical information, gross and microscopic images, immunohistochemistry and other stain results, references and other pertinent information.� This is a good way to quickly refresh your memory on any entity you have not seen in a while. 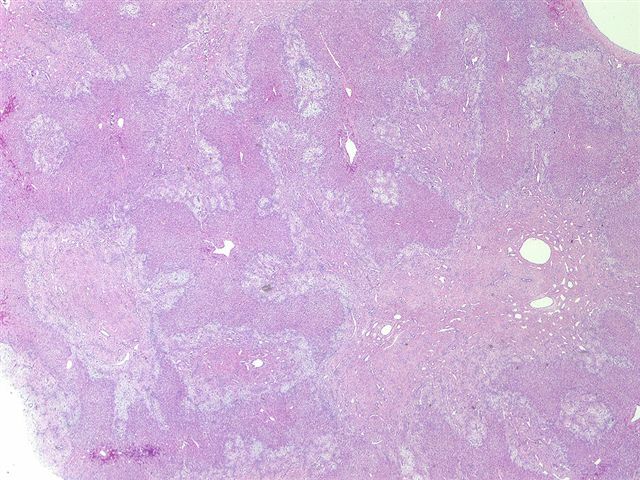 At a well child checkup, a 15 month old asymptomatic boy was noted to have a large, right upper quadrant abdominal mass.� CT scan showed a large hepatic mass extending to the level of the iliac crest.� Laboratory testing showed an elevated AFP at 1398, and the clinical impression was hepatoblastoma. 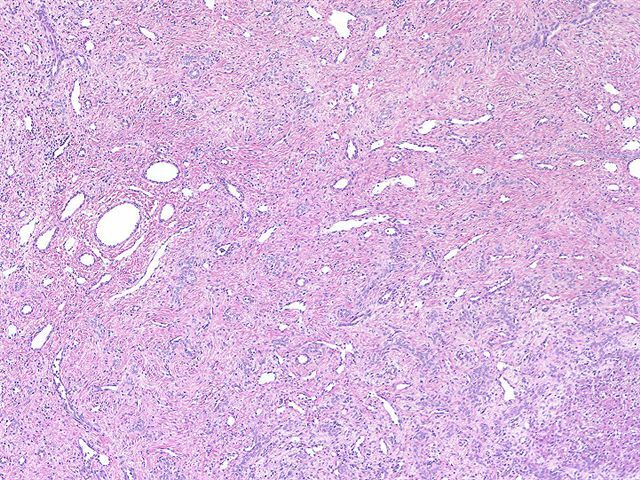 The images show branching bile ducts without atypia in a loose, myxoid stroma with myofibroblast-like cells, dilated vessels and lymphatics.� At low power, it may resemble fibroadenoma.� At high power, normal appearing hepatocytes are often present.� There is usually extramedullary hematopoiesis, and the bile ducts may have a mesenchymal collar.� No atypia or tumor giant cells are present. Mesenchymal hamartoma was previously called cavernous cystic hamartoma, lymphangioadenomatoid tumor and benign mesenchymoma. �It is typically an asymptomatic pediatric tumor, with 75% occurring before age one year and 2/3 occurring in males.� It comprises 8% of all pediatric liver tumors.�� The AFP is typically normal or minimally elevated, although occasionally it is markedly elevated. 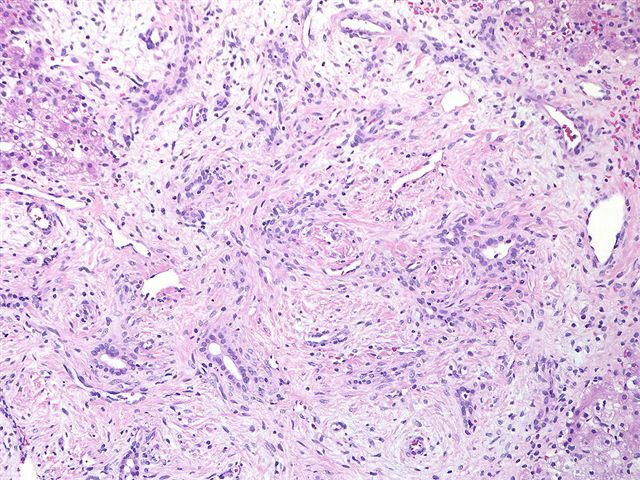 These tumors range from 5-23 cm, and are typically solitary and well circumscribed.� They often have fluid filled cysts (see figure 1), and become fibrotic with age.� There is usually no necrosis, hemorrhage or calcification. 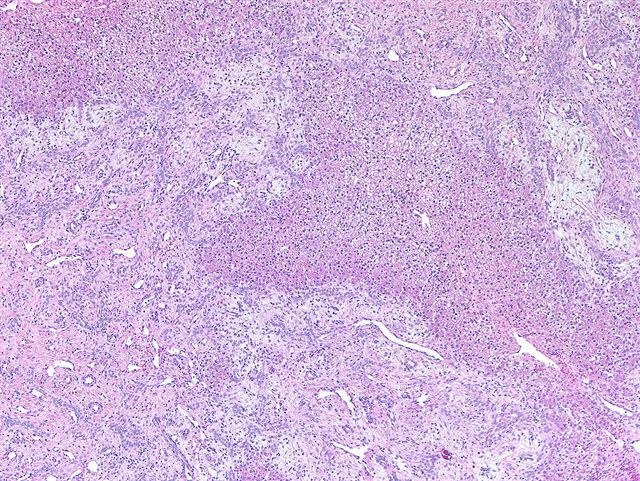 The differential diagnosis includes bile duct adenoma (no hepatocyte islands), bile duct hamartoma (usually multiple with fibrous background), infantile hemangioendothelioma (more vascular) and embryonal sarcoma (marked cellularity and atypical cells).